These adorable treats are lightning fast to prepare – perfect for your next backyard bonfire or just a cozy evening by the fireplace. Happy Halloween! 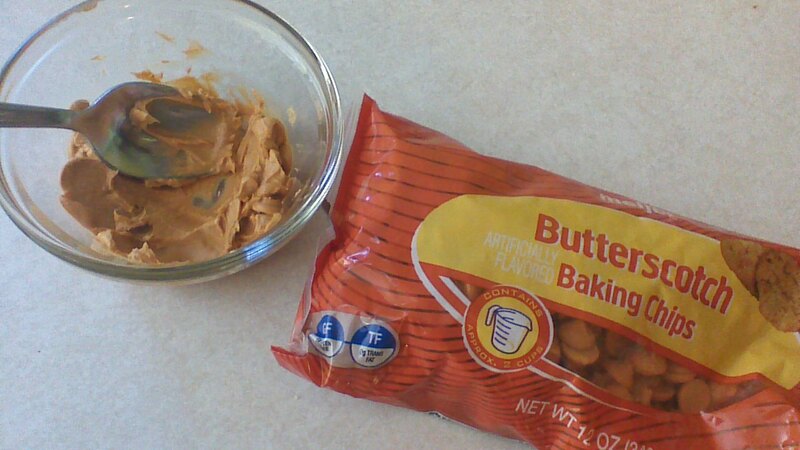 Melt 1/2 cup of butterscotch chips in the microwave, stirring every 30 seconds until chips are fully melted. Arrange six pretzel sticks per campfire as shown, “gluing” pairs of pretzel sticks together using a bit of the melted butterscotch. 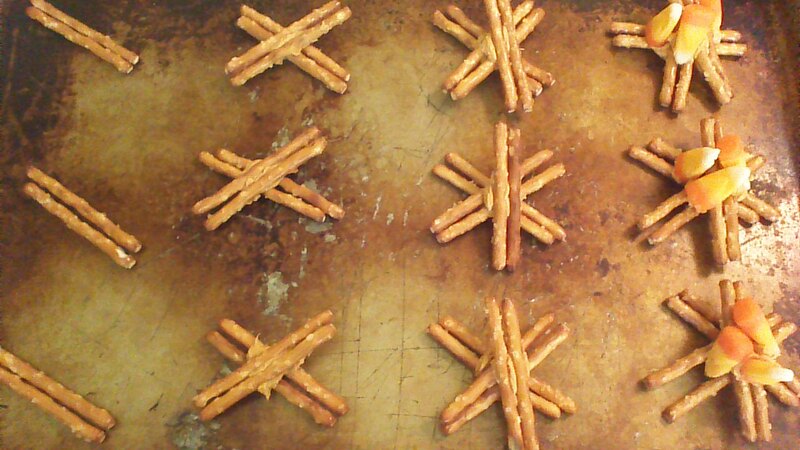 Allow assembled pretzel sticks to set for a few minutes, giving the butterscotch a chance to harden. 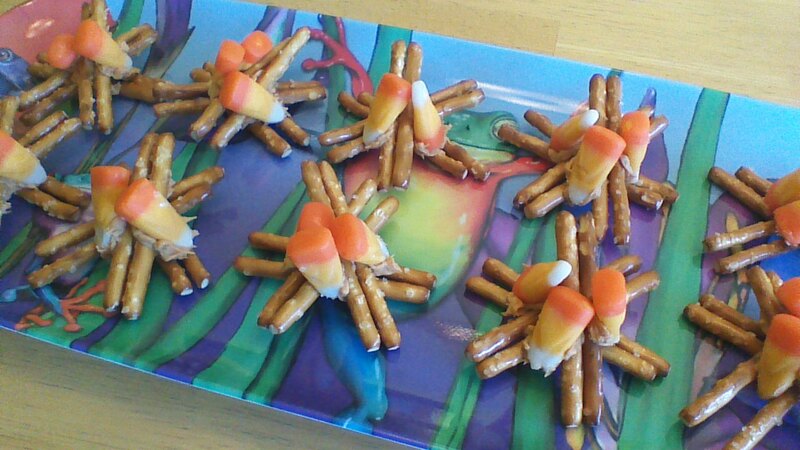 Finally, use melted butterscotch to glue two or three candy corn “flames” to each campfire. Store in an airtight container. A reasonably healthy Halloween treat… imagine! Children (and grown-ups) will love these easy-to-make apple treats. If you are still pondering whether or not to invest in a food dehydrator, what are you waiting for? You’ll recoup the cost after just a few batches of economical, homemade dried fruit. 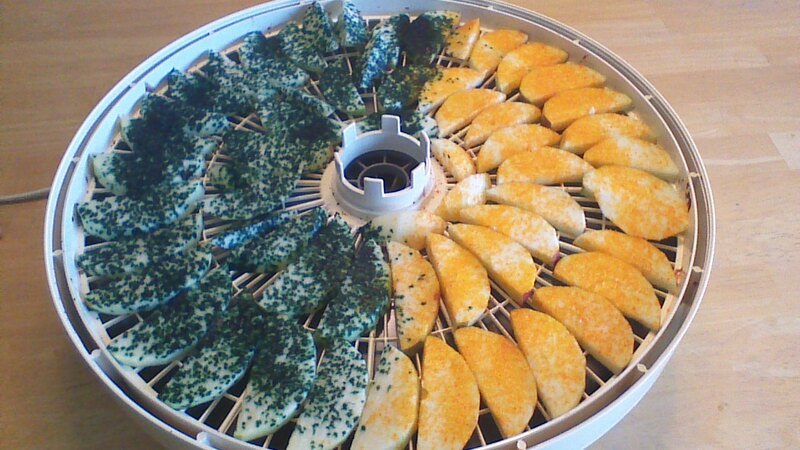 Here’s a link to a dehydrator that costs only $35 with free shipping! You’re welcome. Step 1) Peel and core apples. Slice thin (no thicker than 1/4 inch). 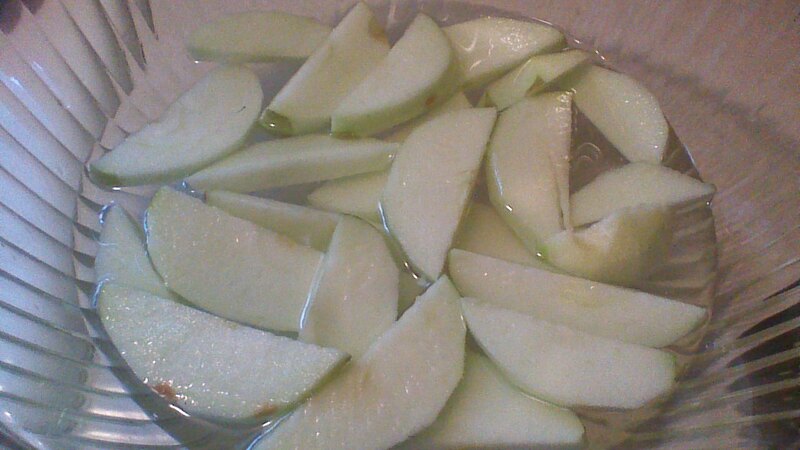 Step 2) As you slice each apple, place the slices in a bowl with the cold water and lemon juice. Simply submerge the apple slices to prevent browning. 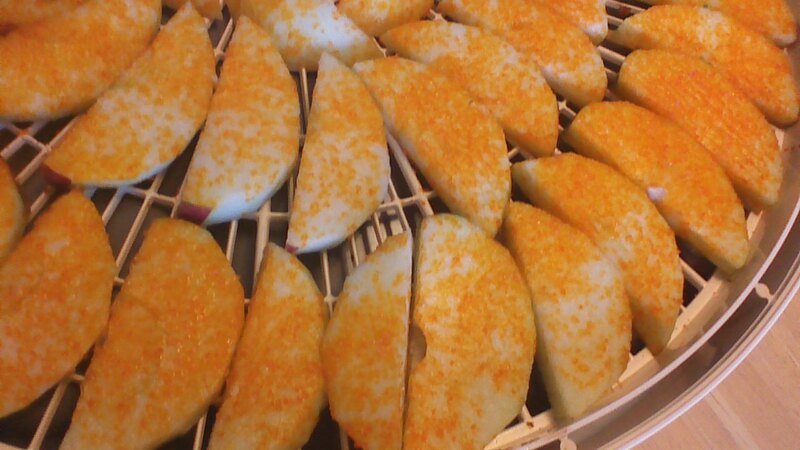 Step 3) Arrange apple slices on food dehydrator trays. It’s OK if the apple slices touch each other just a bit, but they should be in a single layer (not overlapping). Step 4) Sprinkle the apple slices LIGHTLY with colored sugar. Don’t get carried away! Almost immediately, the color will begin to spread out. 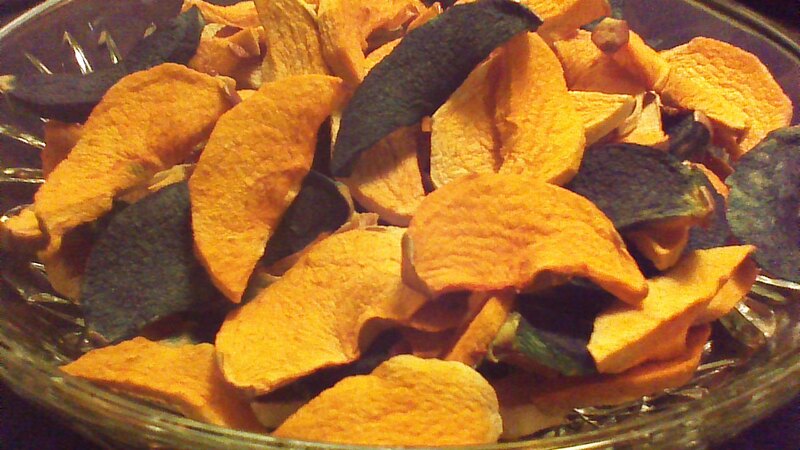 The color will continue to deepen as the apple slices dry. Step 4) Plug in your food dehydrator and allow apples to dry for 12 hours (they may require a bit longer if your apple slices are thick). Apple slices will snap in half easily when they are completely dry.